Explanation: Put on your red/cyan glasses and float next to the jagged and double-lobed nucleus of Churyumov-Gerasimenko, also known as Comet 67P. 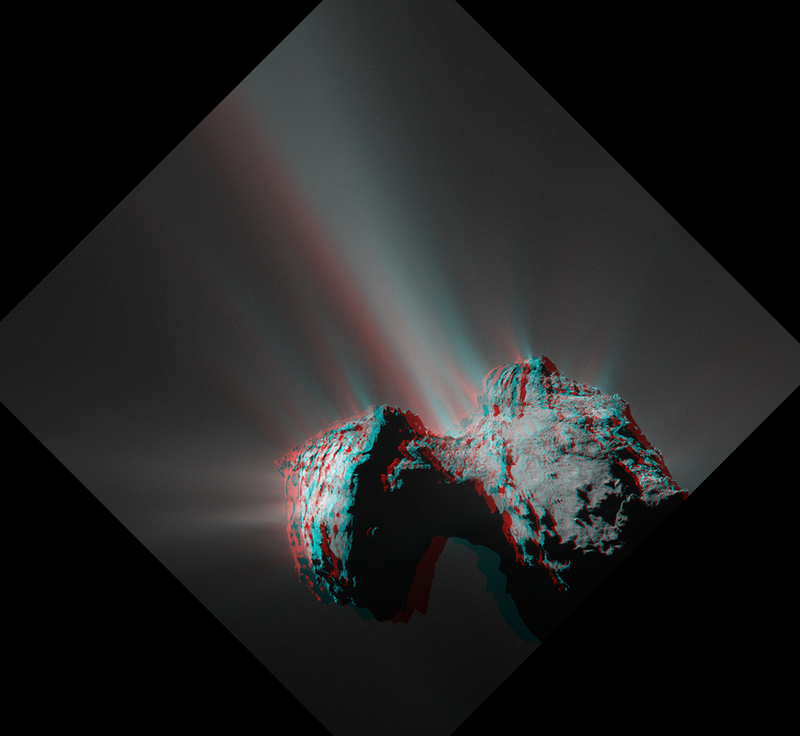 The stereo anaglyph was created by combining two images from the Rosetta spacecraft's narrow angle OSIRIS camera taken on July 25, 2015 from a distance of 184 kilometers. Numerous jets are emanating from the small solar system world's active surface near its closest approach to the Sun. The larger lobe is around 4 kilometers in diameter, joined to a smaller, 2.5 kilometer diameter lobe by a narrow neck. Rosetta's mission to the comet ended in September 2016 when the spacecraft was commanded to a controlled impact with the comet's surface. Keep those 3D glasses on though. You can check out a new catalog of nearly 1400 stereo anaglyphs created from Rosetta image data on this website.